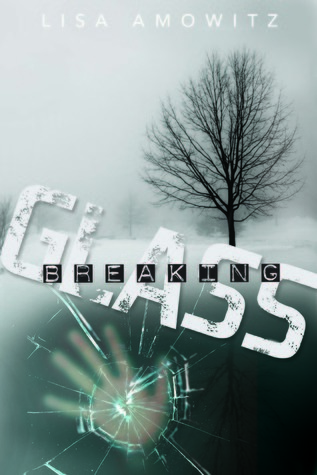 Yes, yes, I know, you're saying, "but didn't you already have your stop on the Breaking Glass blog tour?" Well, yes, I did! But, I didn't get to post my review of this most fabulous book and I wanted to share that with you. I wanted you to know how totally awesome it is! So, would you like to know what I thought??? So, I have to send out a huge amount of thanks to Kate Kaynak of Spencer Hill Press for sending me an actual manuscript (that's right, paper pages, unbound, and clipped together which came in a big envelope to my house)! I was very surprised when it arrived. I knew Lisa had requested for me to get an early copy, but I had no idea it would be like that! I am honored Kate and Lisa trusted me enough to know I would not share it with the world (at least not by copying it, but certainly by reviewing it)! Receiving a copy of this book for free has in no way influenced my opinion or review. So, what's the first thing you notice about this book? Well, it has to be the cover, of course. It is just absolutely amazing. And why shouldn't it be. It was designed by the author herself. Lisa is an AMAZING graphic artist who has done a number of covers for many different authors. I have not found one that doesn't shout out to me how beautiful it is. You really need to check out her work and see how amazing she makes books look: http://lisa-amowitzya.blogspot.com. I think my most favorite thing about this cover is it doesn't shout at you when you look at it. The colors truly reflect the ambiance of the story line. It's simple yet effective in evoking the appropriate emotions from the reader. That is the mark of a true artist for sure! Let me tell you a little bit about the characters.There is not a character in this book who does not have a secret. I think it is one of the most interesting parts of this story; you slowly learn everyone is hiding a secrets. One of the things I love most about this story is it is told from a male POV. I haven't read that many YA books from the male POV. So it's refreshing and honest and different from the normal whining you sometimes hear from the female characters. Jeremy Glass is your typical geeky, history buff who fancies his best friend, but thinks she is too far out of his league. He's got secrets he keeps, which he thinks no one knows about. However, he's not as good at hiding this secret as he thinks he is. He's calm and collected, or at least appears to be until you learn what keeps him this way. Susannah Durban, on the other hand, is his quirky, artistic best friend who trusts Jeremy with her secrets, despite the fact she's dating his best friend. And Susannah is another character who is full of secrets. The interesting thing about how we get to know her is it is totally through Jeremey's POV, since she is not physically present in the novel after the first two chapters. I love how Jeremy slowly figures out things about her he never knew before and shows this to the reader. Ryan Morgan is Jeremy's best friend, and Susannah's boyfriend. He's mister popularity at school and also a lady's man. Tall, handsome and confident, Ryan is truly swoon worthy. But Ryan is not all he seems to be, nor is his family life the picture of perfection Jeremy dreams it is. And when Susannah disappears, he looks more than guilty for the role of having been involved. Every character in this book is intricate and well thought out. Their development is perfectly paced with the book's mysterious premise. As the story unfolds, Amowitz gives us more and more pieces of the puzzle until we finally see it take shape into something we never expected. I can honestly say I was surprised by much of what we learn from and about these characters. And, while these three are the main characters in the book, the secondary characters are not to be forgotten. For they, too, are developed in a way that helps us truly understand the story line. Speaking of the story line, this book was not at all what I thought it would be. Yes, I had a feeling it was somewhat of a mystery with thrilling parts (after all, when you read the blurb you can see that you are in for that kind of ride) but I had no idea how it would psychologically astound me. Every few pages I would look up and literally say "Oh my G-d that did not just happen?" All I can say is to expect the unexpected, for nothing is at all what it seems in this story. In any great story, it is fun to try and figure out where reality ends and fantasy begins, this is one of them. I literally could not find the distinction between the two they were so intricately interwoven. You will be searching your own self to try and figure out if Jeremy is dreaming, or if he's actually being visited by something supernatural. Amowitz does it so well, you really do think Jeremy may be going mad, or maybe he just is! This is the second psychological thriller I have read in the past few months. I didn't think I actually liked this genre of book, but boy was I wrong. And I don't think it's only because I am liking the genre, I think it's because of how well written this book is! And the writing, oh the writing! Well, Lisa has this way of just sucking you right into the story. It's clean and flows off the page. There is nothing that screams "first book" here at all. This writing drips of someone who knows exactly what they are doing; knows how to structure the plot line to slowly unravel itself right before your eyes. There is no overuse of adverbs or adjectives, no long passages that take you out of the story line. There is only what you need to know at that time to keep you interested and wondering what will come next. This book moves at a great pace. You want to turn the page and learn what comes next. You want to get deeper into Jeremy's head to find out what is really going on, and Amowitz's writing allows you to do just that! And the ending. Well, if you think you have it all figured out, you are DEAD wrong. I never saw it coming. I had the plot all figured out for sure and then BAM in comes a twist that pulls the entire story together and totally makes sense! And I really grew attached to Jeremy during this story. I wanted things to be alright for him. I wanted him to have his happily ever after. And, I can tell you he does in his own way. But you'll have to read to find out anymore because I don't want to give it away. All I have to say is that you really want to read and experience this book. I promise you it will not disappoint! 5 Fist Bumps from me! Dayam! Now I am REALLY excited to read this one. I neeeeed my copy NOWWWW! This is an awesome review. You've totally got me even more intrigued than I was to begin. And merci beaucoup for the non-spoiler-presentation. Oooo...so glad you read it! HE HE! I really enjoyed it. the more I think about it, the more I realize that I wish it hadn't ended and that there was more! LOL!